It is something that is only now becoming better realized and understood, but the pure white granulated substance we sweeten our coffee with, add to cake and cookie mixes and generally consume with little care for its consequences is a potentially dangerous part of our diet. Most people simply take sugar for granted and while some may equate its excessive consumption with weight gain and tooth decay, little else is considered. Yet sugar is fast becoming public enemy number one viewed from the perspective of those battling obesity. And those occupying that particular statistic know that they are in league with the numbers that are currently rising out of control. So what do you know about this substance and why should we avoid sugar for better health? This is the white granulated sweet stuff we pour over cereals, in tea and coffee and over strawberries in summer. It is the refined product of the sugar cane plant and what is left behind is the best part, which is that black, sticky, sweet syrup known as molasses. Sucrose is also added to many processed foods and a lot of drinks to sweeten them, but not so much these days as there are sweeter and cheaper alternatives. The most common alternative sweeter is fructose, and is most commonly identified on the label of processed foods as high fructose corn syrup (HFCS). The fructose in HFCS is not exactly the same as the fruit sugar you find in, say an apple - at least not in the way the body processes it. Natural fruit sugars are processed just fine by the body and are broken down into glucose which enters the blood stream and is used as fuel to provide energy for muscular work. Any excess is sent to fat cells for storage. Fructose from HFCS, in similar manner to sucrose is processed in the liver and any excess is stored as visceral fat. That's the dangerous kind that is found in the abdomen and commonly known as "belly fat". Visceral fat behaves differently to subcutaneous fat (found under the skin) in that the cells secrete substances that are no known to stimulate cancerous cells to grow. It probably comes as no great surprise once you realize this fact that there is a pretty obvious link to the rise in cases of breast and colon cancer with the rise in cases of obesity. For most obese people, their excess fat is visceral and that is because a high proportion of the population consumes far too much sugar, particularly sucrose and HFCS. There are plenty of other weight related conditions that are also linked with obesity and excess visceral fat, such as type 2 diabetes, high cholesterol levels, high triglyceride levels, hypertension, heart disease and strokes. There is also a potential link with rheumatoid arthritis, asthma and other allergic conditions and premature aging. Sugar in the body has another big downside in that it promotes the oxidation of cells. When cells are oxidized, they release free radicals into the body that are known to wreak havoc and are linked with a variety of cancers and other medical conditions. Most of us now know about the properties of antioxidants and we are having to consume them in ever rising amounts to combat the volume of free radicals in the body. But it doesn't stop there. All this cell damage causes premature aging of the body because cells die faster and need to be replaced with new healthy cells. This process was always considered to be a good thing, until the discovery of a "tail" on the end of DNA strands that grows a little shorter every time cells divide. It's like a ticking clock because when it can't get any shorter, it starts to reduce the length of the DNA strands that carry the vital genetic information, cutting short some of the instructions so that cells can no longer replicate and simply die. It's like signalling the end of life itself. So just remember all that next time you fancy some sugar in your coffee, or have a hankering for that chocolate bar or yummy looking cookie. You could literally be eating yourself into am early grave! 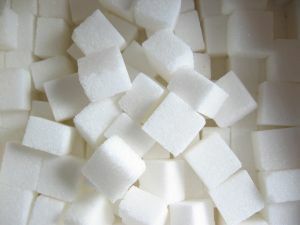 You can find out more about the sugar related disease of diabetes here: Diabetes Health Concerns.